Preface This book has been designed to meet the scope and requirements of students. It fulfills the purpose of the students who are appearing for IIT-JAM ( Joint Admission Test for MSc from IITs ) and II Sc. It is also useful for those who are aspiring and preparing for competitive examinations such as CSIR-UGC-NET/SET, UPSC or other State service examination. The topics cover a number of innovative features, including multiple choice questions and real-world application, designed to enhance student learning. We strive to make Physics, as a discipline, interesting and accessible to students. With this objective in mind, the content of the book has been developed and arranged to provide a logical progression from fundamental to more advanced concepts of Physics. 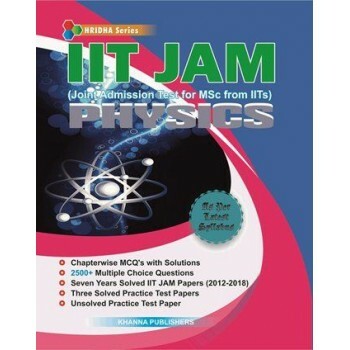 The main purpose of this book is to help students to know about the pattern of questions asked in various competitive examinations and also provide them topics for their preparation. Each topic has been covered comprehensively with number of multiple choice questions along with their explanations wherever needed. Every attempt has been made to make this book student friendly, but some errors might have crept in. Suggestions for improvement of the text, and intimation of misprints will be thankfully acknowledged. Table of Contents * Interference * Diffraction of Light * Polarization * X-Ray Diffraction * Laser * Fibre Optics * Solid State Physics * PN Junction Diode and Break Down Diode * Electronics * Mathematical Physics * Thermodynamics * Air Compression, Steam Power Plant and Heat Transfer * Quantum Mechanics * IIT-JAM Solved Papers 2012-2016 * Solved Paper 2016 (BHU) * Solved Practice Papers ( I, II ,III) * Unsolved Practice Paper * Solved Paper-IIT-JAM 2018.